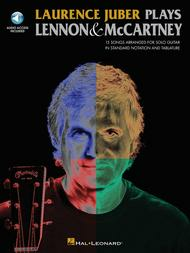 Laurence Juber Plays Lennon & McCartney by Laurence Juber and The Beatles. For Guitar. Guitar Solo. Softcover with CD. Guitar tablature. 72 pages. Published by Hal Leonard (HL.701836).ISBN 1617741221. With guitar tablature. 9x12 inches.Here are 15 transcriptions matching the SolidAir Records CD LJ Plays the Beatles, Vol. 2. Laurence Juber, Wings lead guitarist and two-time Grammy-winning fingerstylist, arranged the songs for solo guitar in standard and altered tunings, extensively fingered in notation and tablature. Includes: All I've Got to Do • Blackbird • Dear Prudence • Drive My Car • Eleanor Rigby • Here, There and Everywhere • I Am the Walrus • I Feel Fine • The Long and Winding Road • Michelle • No Reply • Penny Lane • Please Please Me • When I'm Sixty-Four • and You Can't Do That. Features a special one-hour masterclass with Juber on the accompanying CD!